The next flu pandemic is approaching. What's your plan? Flu viruses usually enter through your nose, mouth, or eyes. An N95 respirator (above) helps block the viruses by filtering very small particles - including germs - from the air you breathe. Wear it when caring for or otherwise exposed to the sick. Tip: Some have a one-way vent/valve (as in picture above) for easier exhaling & to reduce heat build-up. NOTE: N95 respirators are in limited supply. Some local pharmacies and medical supply stores are out. Others are limiting quantities per purchaser. 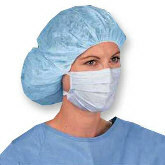 Facemask (above) mainly helps keep you from spreading germs when you cough or sneeze. Protects other people from your germs. Wear it if you're sick. Use once; don't share. "A New Pandemic Fear: A Shortage of Surgical Masks"
"Flu's Spread in Japan Causes Shortage of Surgical Masks"
Are your contingency plans applicable to a pandemic? If 25-30% absenteeism, are essential functions covered? Can core activities be sustained several weeks? Have a healthy work environment. Empower the sick to stay home. Revise policies. Plan for interrupted public services (sanitation, water). Reduce healthcare costs & healthcare system overload. Strategy - Reduce exposure by reducing personal contact. "Social distancing." Tactic - Segregate your staff. Use multiple locations/shifts, including temporary offices and working from home. Telecommuting tools (below) keep employees connected & keep work flowing. GoToMyPC - To access your PC .. network .. data .. email from ANYWHERE. GoToMeeting - To conduct online meetings, conferences & presentations with ANYONE. USB flash drives to manually carry applications and data files for use elsewhere. In the U.K., the number of flu patients in intensive care has doubled in a week to 190, according to the Daily Mail. The 17 most seriously-ill patients are on highly-specialized heart-lung machines known as ExtraCorporeal Membrane Oxygenation (ECMO) units – three times the usual number. Even at the height of the swine flu pandemic last year only 12 of these machines were ever in use at the same time. The newspaper says it's feared that the swine flu strain may have grown more virulent over the past 12 months. UK hospital managers have been holding emergency meetings to draw up plans to tackle a further onslaught of cases. Take this seriously. Remember, we're still early in the flu season in the Northern hemisphere. Dr. Niman: Is D225G in severe swine flu? Concerning the surge in severe suspected swine flu cases in parts of Europe, Dr. Henry Niman suggests it may indicate that D225G or other receptor binding domain changes are on the rise. Last season the acquisition of D225G was linked to severe and fatal cases, but the level of D225G in circulation was relatively low. However, the virus with D225G was deemed a "low reactor" and there were concerns that, once global immunity to wild type pH1N1 was established, the level of D225G could increase substantially in a variant that emerged between seasons. In the UK, while general levels of suspected swine flu seem low, a surge in severe cases already exceeds the peak levels of last year in some areas ... and has medical leaders worried they can't handle the potential caseload. Already, 15 patients have died and more than 100 are in intensive care. Intensive care specialists said that the NHS was under greater pressure than 12 months ago. There has been a surge of cases admitted to hospital in the last 10 days and in the North-west the numbers are above those at the peak of last year's pandemic. ...In the North-east, the situation is "as bad as or worse than" at the peak last year, according to public health specialists. Most of those affected are aged 18-35. ...The numbers of severely ill patients have taken specialists by surprise because monitoring suggests low levels of swine flu in the community. ...Bob Winter, president of the Intensive Care Society and a consultant in Nottingham, said: "Something different is happening this year. The last 10 days have seen a sudden surge of activity. The numbers in intensive care are increasing across the UK. In the north west they are more than at the peak of the pandemic. "We have told the Department of Health that this is emerging as a serious issue. We suggested the groups convened last year for swine flu critical care planning should be reconvened. The disease seems disproportionately severe." Richard Firmin, director of the the UK's main ECMO centre at Glenfield Hospital, Leicester, with five beds, said: "It is very busy, even busier than last year. The way we are headed we are not sure we will have enough capacity. We have 15 beds open altogether – we didn't need more than 12 last year. We have pretty much activated all those who can do it. "No one was expecting it to be worse this year than last year." ...[Dr Firmin added,] "We have already had to escalate [provision of ECMO beds] two steps beyond what we had last year. Things are at least as bad as they were last year in intensive care generally, as well as ECMO. What we don't know is whether this is the peak or there is worse to come. Our feeling is it is probably going to get worse. If it gets a lot worse we could be in a lot of difficulty." Suddenly, there seems to be a public perception that the H1N1 swine flu pandemic is over. At least, that's the sense I get within the U.S. public. It's thankfully true that instead of officially having "widespread" flu activity nationwide in the U.S., only four states reported "widespread" activity last week, down from seven the week before. However, outpatient medical visits for flu-like illness, which were at the national baseline the previous week, edged back above that level, according to the CDC. Also, deaths due to pneumonia and flu climbed back above the epidemic threshold. But just because flu activity may have declined where you live, don't think the pandemic is over. It isn't. Flu viruses are known to be imprecise when they replicate, with the result being mutations or changes in the genetics of the "offspring" viruses. When a change like this happens, a copy of the virus suddenly has a new trait. The new trait may be good for the virus (makes it better able to thrive, spread, reproduce). Or it may be bad for the virus, making it less "fit" for survival and reproduction. Of course, when you're talking about a virus that causes flu in humans, what's good for the virus is bad for people ... and what's bad for the virus is good for people. For example, there have been a few cases where the H1N1 virus causing the current flu pandemic has developed (mutated) a resistance to Tamiflu, one of the antivirals used to treat the flu. That's bad for people because if the virus won't respond to Tamiflu we've lost an important medical treatment. So far, this mutation has only happened on rare occasions. The hope is that those particular viruses don't begin to "take hold" and reproduce/spread widely. There's another particular mutation which, in the opinion of some, is much more troubling. This is a change in an amino acid at position 225 in the hemagglutinin (HA) protein on the surface of the virus. (Hemagglutinin is the "H" in "H1N1".) This change in the "receptor binding domain" in the HA protein causes the virus to prefer to attach to a different type of cell in the human body. While flu viruses usually attach to cells in the nasal/throat "upper respiratory" area, these mutated "D225G" viruses prefer to attach to cells down in the lungs. This is not typical and is not good because it often results in severe disease in the lungs ... and I'm talking SEVERE. Many cases result in hemorrhagic pneumonia and death, as high concentrations of the D225G virus triggers a so-called "cytokine storm" reaction in lung cells. Due to the location of the virus, an unfortunate consequence is that it's difficult to know when a person has the D225G version of H1N1. That's because when the sick person is tested, the sample is obtained by swabbing the nose or throat, where the D225G H1N1 isn't - it's down in the lungs. So the test shows either no flu or the regular H1N1 (if some of that original version happens to be in the nose/throat while the D225G version is in the lungs). The existence of this D225G mutation first got the spotlight in late October in the Ukraine. There was a real spike in H1N1 cases there ... and reports that some H1N1 fatalities reportedly were young people who had severe hemorrhagic pneumonia. One regular flu blogger, Dr. Henry Niman, wondered if the Ukraine H1N1 had changes in the receptor binding domain in the HA protein. On November 19, receptor binding domain change D225G was confirmed in H1N1 samples from the Ukraine. The World Health Organization released genetic sequence information from 10 Ukraine H1N1 samples. Of the 10 Ukraine cases, there were four fatalities ... and all four had receptor binding domain change D225G. Furthermore, the virus was found in the lungs/throat, not in the upper respiratory nasal area. On Nov. 20, scientists in Norway said they'd found mutated D225G H1N1 swine flu in two dead patients and one severely ill. The scientists noted that the virus could "infect deeper in the airways." At the same time, piecing together information, the WHO said "a similar mutation in viruses" had been detected as early as last April in seven countries: Brazil, China, Japan, Mexico, Norway, Ukraine, and the United States. These are still isolated cases and, for the record, WHO says "the public health significance of this finding is thus unclear." The mutation has been seen in mild cases, as well as fatal cases. And "numerous fatal cases have not shown the mutation," WHO says. In addition, some observers, such as virology Professor Vincent Racaniello who publishes the Virology Blog, says it's not a concern - and, in fact, the D225G mutation makes it more difficult for H1N1 swine flu to spread. Nonetheless, the fact that a change in some H1N1 could make the virus more likely to infect deeper in the airways and cause more severe disease is leaving many observers with an uneasy feeling. It's something that bears watching. Remember that the greater the number of severe flu cases, the greater the load on hospitals. Since viruses mutate readily, if this D225G mutation doesn't prove to be a major problem, there's always the chance that some other mutation will. Flu viruses are not ones to be trusted, so to speak. It's not too late to get some very crucial and practical preparedness planning completed and implemented in your organization. But time is of the essence. No more feeling your way through the preparedness black hole. Execution is everything now. And it helps if somebody else has tried it and is willing to share which best Practices worked and which didn't. To try to bring a very current, practical, and execution-driven summary of what we all can do to have the highest level of preparedness in our organizations, CIDRAP is sponsoring its third pandemic preparedness summit on September 22 and 23 in Minneapolis. "Keeping the World Working During the H1N1 Pandemic: Protecting Employee Health, Critical Operations, and Customer Relations" is the title we've chosen for this 2-day crash course and summary of the latest, most effective actions your organization can implement to be better prepared. While I'm sure this summit has been in the planning for a long time, the timing is certainly right. Europe anticipates surge in swine flu; triggered by schools? Health authorities across Europe are bracing for a third of their populations to become infected with the new swine flu virus this autumn, but do not plan to close schools or take other drastic measures to stop it. Instead, they plan to educate people about hygiene, get vaccines out as soon as possible, and hope the H1N1 pandemic does not become deadlier than it has been. Asia is going to be way short of the new H1N1 vaccine to fight swine flu when the next surge of infections hits during the cold season this year, a spokesman for the World Health Organization (WHO) has told Reuters. "Nowhere is ready ... there is going to be massive underproduction of vaccines as compared to the needs and demand," said Manila-based WHO spokesman Peter Cordingley. To illustrate, Australia, China, Japan, and Indonesia all have vaccine production facilities. But, China will have enough to cover only 5% of its population by year-end. Japan can make only 1/3 of the swine flu vaccine it needs ... and hasn't started production yet. Indonesia has a state-run vaccine production facility, but, with a population of 226 million, has not contracted with foreign vaccine makers to supplement its own production. The question of whether North Texas is prepared for a possible onslaught of H1N1 flu is inextricably linked to the state of the American economy. In an era of continuous cost cutting, is your bank going to spring for bottles of hand sanitizer at every teller station, "high-touch" counters and ATM machines? Is your employer going to redouble its efforts to make sure its restrooms are clean and well-stocked with paper towels and hand soap? ENCOURAGE employees with the flu to STAY HOME at the first sign of illness. It's best for the worker; it's best for co-workers. Don't request written doctor's excuses. That just further burdens a healthcare system that will be overloaded. Educate employees about respiratory etiquette and hygiene: wash your hands frequently and well ... use hand sanitizer ... cough into a tissue/sleeve/arm, not your hand. Disinfect work surfaces regularly, especially those frequently touched by many people (e.g., table tops, counters, telephones, door knobs). Encourage vaccination against both seasonal flu and H1N1 swine flu. This blog began in 2005. This blog is more of a reference site than a running commentary. * For news & quick comments, Follow me on Twitter. » All countries will be affected. » Medical supplies will be inadequate. Because a pandemic affects many people in many places at once, federal governments can only provide limited local help. They'll do all they can. But that won't be enough. Why all the talk about a "three-day supply?" A pandemic likely would last more than a year, coming in multi-week waves. Obviously, a three-day "disaster kit" is not sufficient. What do you do on the fourth day of a "three-day supply?" Stockpiling can help reduce the spread of a pandemic flu. We need more of it. In a pandemic, it doesn't matter what medical treatments we have today, if we don't have enough of them at the point and time of need. The Wall Street Journal notes that "just-in-time" deliveries and inventories are at odds with the "just in case" rationale behind emergency preparedness planning. A chain with many links has more chances for disruption. Less apparent indirect consequences (ripple effects) might be widespread. You're right, it's not 1918. Yes, we have modern advantages. But we also have inadequate surge capacities, complex modern systems, and changed populations. What is Tamiflu? How does it work? Who needs it? Tamiflu can reduce the length and severity of the flu. Q: Should you buy a personal supply? In the event of a major flu pandemic, who keeps the kids? Parents, what do you do? Employers, what do you do? WHO says the overriding communications goal is trust. Be candid. Acknowledge uncertainty. Avoid excessive reassurance. Trust the public's ability to handle it. » Add infectious diseases to contingency plans. » Identify essential functions, personnel, and outside activities. » Tell workers about your pandemic plan. GoToMyPC, GoToMeeting, and USB flash drives. Access your PC .. data ..
Running a business with 25% absenteeism. Up and down the supply chain, the same problem. leave policies, workers' compensation, health insurance, union agreements. » It's more reference site than running commentary. » Some posts are long -- "backgrounders" on uncommon topics. » I may post in spurts, rather than daily -- and sometimes retroactively. I revise content, as needed.